Many hours were spent cleaning and polishing the 19th century home. Floorboards needed to be swept, carpets and rugs beaten to remove dust. Silver, glass and wood were polished, windows washed, fireplaces cleaned and grates buffed until they shone. Before the 1880s furniture polish and cleaning materials were home made. Ingredients such as charcoal, linseed oil, pounded galls and hogwood chips were all used to make polishes and creams for cleaning the different furnishings. 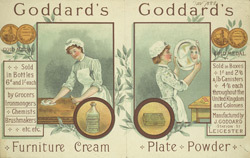 Mass produced cleaning creams and polishes were developed during the 1880s and more and more products were introduced to make the job of cleaning easier.